Sure Clip is the better way to cut your nails! 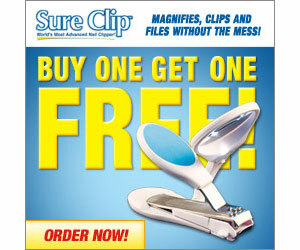 It magnifies, clips and files without the mess! The 3x Magnification with Super Bright LED Light makes it easy to see where you are cutting. It has a wide-non-slip comfort grip and to ensure a clean cut, it has a built-in diamond edge nail file. It also catches all your nail clippings for easy disposal later.